Venus and Spica in the morning twilight. 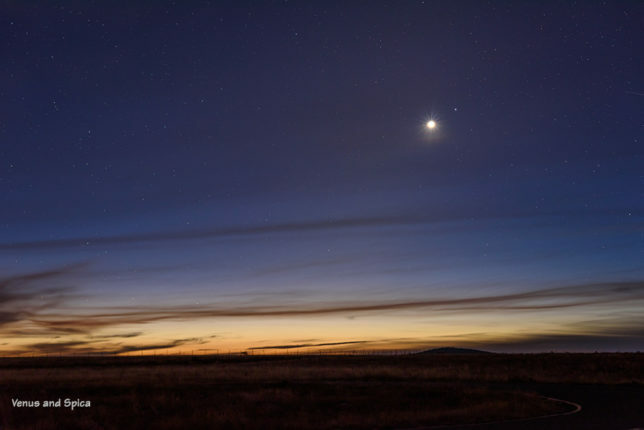 There’s a new comet in the morning sky. The comet was discovered in early November by three amateur astronomers—one in Arizona and two in Japan. Nowadays, most comets and asteroids are discovered by robotic Near-Earth-Object (NEO) search programs. The discovery of a comet by amateur astronomers is becoming a rare event. So, with that bit of information, I set out to capture some images of the comet. As an 8th magnitude object it would not be easy using a short telephoto (i.e., 85mm focal length). 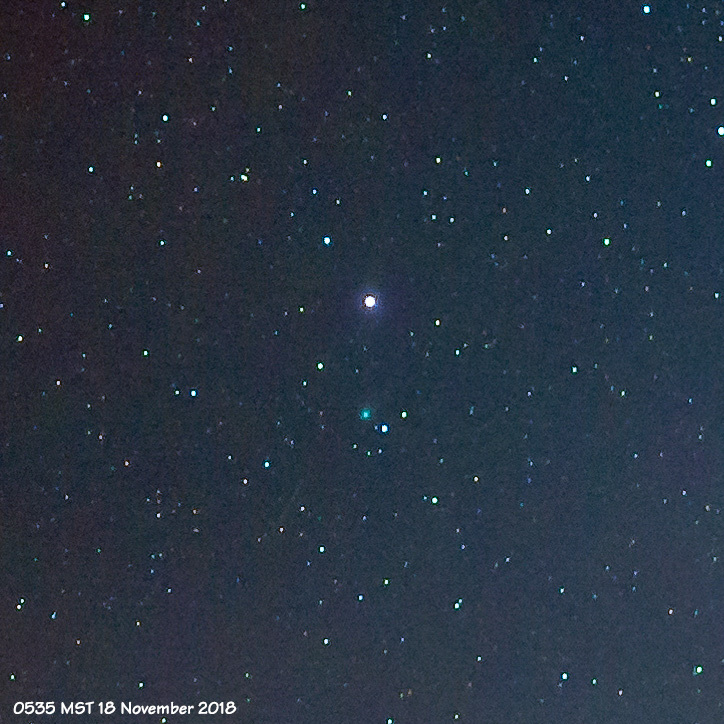 My first attempt was marred by clouds but after viewing the images later I was finally able to find the small and not very bright comet. A few days later I tried again. And, once again, high clouds moved across the sky. Finally, just before twilight, the clouds moved out of the way and I was able to get about 25 minutes of images. Because the comet is so dim, individual images are not very revealing. In this case, better results are obtained by creating a short animation over the 25 minutes showing the motion of the comet relative to the stars. As the eastern sky brightened the planet Venus and nearby star Spica stood out (image at top of post). A very nice end to a morning of shooting photographs in the cold.